Last weekend, I was on my Christmas cookie-making bender, and there are always two treats I try to make - my mom's snowflake sugar cookies and Rum Balls. Those no-bake, booze-laced treats were always a hit at parties and the office. 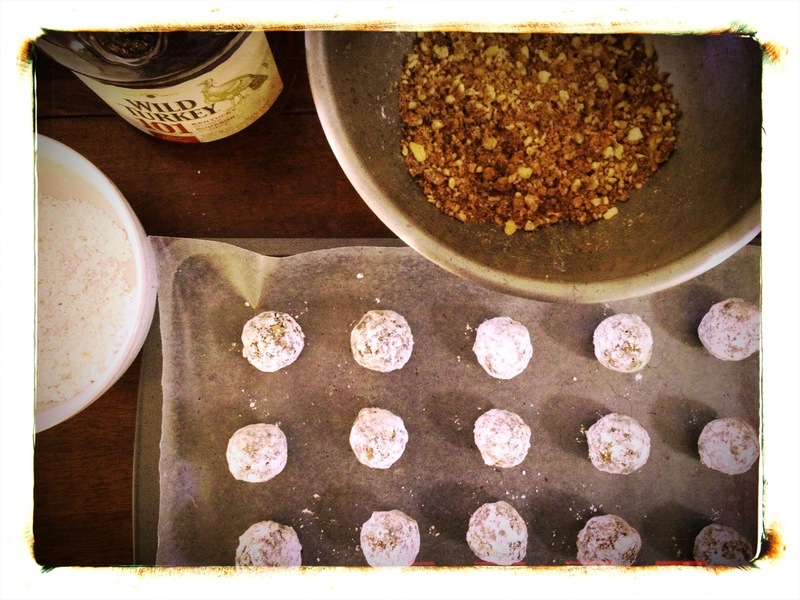 When I saw a variation on that cookie with these Hot-Spiced Bourbon Balls from Liquor.com, I just had to try the recipe. Everyone knows how the Lush Chef loves her bourbon and I liked the blend of cayenne pepper with holiday spaces. For those who don't have a handle on the whole baking thing, then these cookies are your ticket for all those holiday cookie exchanges and potlucks. There's no oven involved and these can be whipped up in less than an hour. The hardest part is perhaps rolling the mixture into balls. I find it's easier to pulse the cookies and nuts so they're a finer texture (I could have pulsed mine a little longer, frankly), and if you feel like the mixture is too dry, then add a tiny bit more molasses and bourbon. A little trick in forming the balls is to put an entire handful of the mixture into your palm and work it down as some pieces fall off. If you like more of a chocolate flavor, you can dust the cookies in a mixture of cocoa powder and confectioner's sugar. - In a small bowl, whisk together the bourbon and molasses until well combined. - In a large bowl, sift together 1 cup of the confectioner's sugar with the cocoa powder, cayenne, mace, cinnamon and salt. - Using a wooden spoon or spatula, stir in the bourbon mixture until a smooth paste forms. - In a food processor, pulse the wafers into fine crumbs. - Add the wafers and pecans into the bourbon mixture and stir until it's kind of doughy and workable. - Roll the dough into 1 inch balls and then roll them in the remaining confectioner's sugar. - Store in an air-tight container on sheets of waxed paper in the fridge for up to four days.